WC Custom Meats named Supplier of Year by Fareway | Webster City Custom Meats, Inc.
Pictured are, from the left, Jeff Cook, vice president of market operations for Fareway, Aaron Irlbeck, senior vice president of procurement for Fareway, Connie Ingraham, president and chief executive officer of Webster City Custom Meats, Diane Knudsen, sales and marketing, Webster City Custom Meats, Phil Voge, vice president of Webster City Custom Meats, Reynolds Cramer, chief executive officer for Fareway, Steven Peterson and John Turner, both meat buyers for Fareway. Chip Abbott, secretary-treasurer and chief operations officer for Webster City Custom Meats, was not present for the photo. 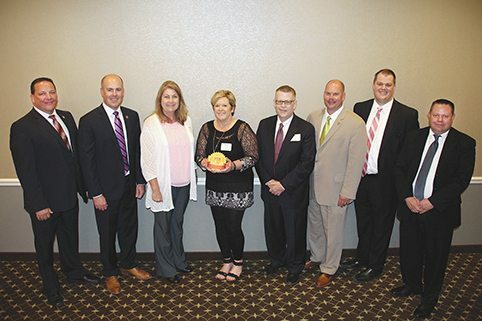 A Webster City business was recently honored for its partnership with Fareway Stores Inc.
Webster City Custom Meats Inc. was named the Supplier of the Year by Fareway at an Iowa Grocers Association luncheon in Johnston. Webster City Custom Meats specializes in custom meat processing of smoked ham, smoked bacon, fresh sausage products, boneless ham roasts, and smoked pork loins, according to the company website. Connie Ingraham, president and chief executive officer of Webster City Custom Meats, and Phil Voge, vice president, attended the luncheon on June 2 along with Diane Knudsen, sales. All three said they were very surprised when the award was announced. Ingraham said the two Iowa-based firms share similar philosophies and commitment to the end user. “I think they see that in us and we try to partner with them as true partners,” she said. Both Voge and Ingraham were quick to credit their employees for their dedication and hard work. “It takes all those people behind the scenes to make everything happen and click together,” Ingraham said. “From a production stand point, it’s refreshing to have someone reward you for all the hard work you’ve done,” Chip Abbott, chief operations officer, said. Voge sent a letter detailing the award to all of the employees. He said the company would host a celebration with employees in the near future.